A Gift For The Foodie In Your Life! 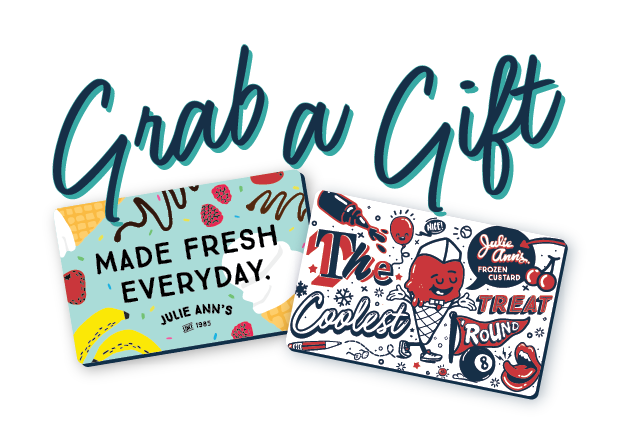 Something for them, something for you… grab a gift card to go with a concrete or sundae for yourself! Our gift cards come with a embossed “Frozen Custard” red gift card holder in a beautiful blue envelope. We currently have two different cards to choose from. Brand New Design In Time For Thanksgiving! Introducing our newest style just for Christmas. Here at our shop we listen to a ton of 80’s music… The Flock, The Cure, Huey and the News, and this holiday season we wanted to show the best of that world (complete with a Magic 8 Ball). Come by the shop, or give a call and we can mail one to your loved one. We are a family owned and operated frozen custard shop serving the McHenry County area. We are dedicated to providing fresh and locally produced flavors, sundaes, shakes, affogatos, and concretes. We are located at 6500 NW HWY, in Crystal Lake, IL. We are located next to the IHOP, across the street from Walgreens and CVS in the Plaza.